The Original Recording of "Jerry Sings Broadway"
Grillo.....has a strong, upbeat jazz voice with an edge of cockiness in it that allows him to put a personal touch on these tunes made famous by other singers. Although Grillo's voice is unique, his presentation of jazz standards draws comparison to any number of predecessors such as Buddy Greco, Bobby Darin, and of course Sinatra. He was presented with the Wisconsin Area Music Industry's Jazz Artist of the Year award in 2011 at Turner Hall in Milwaukee, Wisconsin, along with nominations in 2012 and 2013 for the same category. The assured phrasing, slight alteration of lyrics, and forcefulness of style allow Grillo to join that fraternity of singers who use their take-charge attitude to win over an audience. Grillo delivers a vocal punch to match the blasts of the brass section. Grillo is an entertainer who can get a crowd into the performance through his personality and delivery. 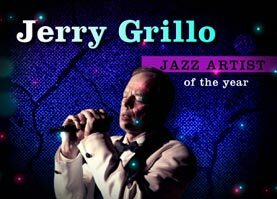 Jerry Grillo is a Jazz Vocalist based in Milwaukee, Wisconsin. See the Biography and Video page for details on Jerry's career, and his Performance Schedule page for his appearances in Milwaukee and elsewhere.